DOL’s “Persuader Rule”: Fight on! NLRB fails to bargain in good faith? Uber announces $100 million settlement of independent contractor class actions in California and Massachusetts, but is it “whack-a-mole” time? DOL’s “Persuader Rule”: Fight on! – As we have previously reported, the U.S. Department of Labor on March 24 issued new regulations that adopt a new interpretation of the "persuader" reporting requirements under the Labor Management Reporting and Disclosure Act. The new regulations under the LMRDA, if they withstand already-filed court challenges, will take effect July 1 and will require extensive financial reporting regarding relationships between employers, labor consultants, and attorneys involved in what the DOL views as outside persuader activity, direct or indirect, to persuade employees in the exercise of their rights of union organization. Both the new regulations and prior DOL interpretation have required employers and their labor consultants who engage in any "persuader activity" to file reports about their use of consultants and lawyers. But under prior longstanding interpretations of the LMRDA, an "advice exemption" limited application of the financial reporting obligations for attorneys and consultants who assisted employers in labor relations activities so long as the activities were "advisory" to the employer (that is, as long as the attorneys and consultants communicated with the employer or each other and not with employees). The new regulations attempt to narrow the advice exemption, by limiting the exemption to (1) advice that does not have persuasion of employees as its object and (2) representation in collective bargaining, and legal and administrative proceedings. Any services that do not fall into one of these categories will be labeled by the new regulations and the DOL’s interpretation of the LMRDA as indirect or direct "persuader activity" and not "advice." The new interpretation largely swallows the "advice exemption" and will mean that many more entities — employers, attorneys, and consultants — will have an obligation to report financial information on labor relations activity, expansively defined, on at least one of three mandatory DOL forms, one of which — the LM-21 Form (Consultant Receipts and Disbursements Report) — is currently unsuited to the new regulations. The reporting obligations are huge, and failure to comply can result in criminal sanctions. The DOL has held back on issuing the new regulations for several years, primarily because of concerns – expressed by many, including the American Bar Association – that the proposed rule would intrude upon the attorney-client privilege. Although the final rule has been toned down somewhat, it still requires disclosure of confidential attorney-client matters and communications on the combination of the three required forms – the LM-10 (Employer Report), the LM-20 (Consultant Report), and the LM-21(Consultant Receipts and Disbursements Report). Because these mandatory forms impose significant recordkeeping burdens and seek potentially privileged information, the rule may deter smaller employers from seeking legal advice in labor matters, which may hinder employer effectiveness in union campaigns while increasing the risk that some employers will commit unfair labor practices because they do not have the benefit of legal advice. As might be expected, the lawsuits seeking to block the Persuader Rule have been rolling in since the final rule was issued. Links to copies of the lawsuits are available here. The final rule as announced took effect on April 25 and was to apply to all persuader arrangements and activity as of July 1. On April 14, the DOL clarified that it will not require compliance with the new rule with respect to any persuader activity or arrangements before July 1. Meanwhile, the DOL’s Office of Labor-Management Standards announced on April 13 that it would not take enforcement action against entities who failed to complete two central sections of its LM-21 Form, apparently because those sections of the form now need to be modified to fit the new regulations. Modification of the LM-21 Form is not on the OLMS’s agenda until September, two months after the July 1 compliance date. Employer representatives had raised this “clash of forms” issue with the DOL during the rulemaking period, but the DOL did nothing to fix the problem in advance. This was apparently because the anticipated changes to the LM-21 form will intrude further on the attorney-client privilege and therefore are expected to set off a firestorm of their own. Separate from the regulatory and court proceedings, on April 15, Rep. Bradley Byrne (R-Ala.) introduced a resolution to block the final rule. However, it is unlikely that the resolution will have any real effect, even if it passes: President Obama could (and almost surely will) veto the resolution, and the House is unlikely to have enough votes to override it. The legal and political fight over the “persuader rule” is not likely to subside before the 2016 Presidential election. Employers using any outside consultants or attorneys to handle labor relations matters will need to stay up to date on this subject and in close communication with their legal teams to deal with the new regulation in some manner if the legal challenges fail and the DOL continues on course. We will keep you posted. Supreme Court splits 4-4 in case involving public employee union agency fees - As previously reported, the post-Scalia Supreme Court tied, leaving in place a lower-court decision that rejected the claim of several public school teachers in California that they should not be forced by the state – under penalty of discharge – to pay "agency fees" to a teachers’ union. In Friedrichs v. California, the teachers’ union had a collective bargaining agreement with the state school district that included a union security clause. The U.S. Court of Appeals for the Ninth Circuit had rejected the teachers' arguments that the union security provision violated their rights under the First and Fourteenth amendments to the U.S. Constitution by requiring their support of an organization engaged in political activity, dealing with the state. The Ninth Circuit agreed with the State of California and the unions, which argued that allowing the teachers to escape fees would let them be "free riders" and gain the benefits of the union bargaining activity without bearing any of the costs, a line of reasoning adopted by the Supreme Court in 1977. The state and the unions contended that the mandatory agency fees were used only for bargaining and related union activity, not for any political activity. The plaintiffs argued that union activity dealing with a government is inherently political. Commentators had speculated that the Supreme Court would reverse the Ninth Circuit decision by a 5-4 vote with conservative justices in the majority. However, Justice Antonin Scalia died after arguments but before a decision was rendered. Without Justice Scalia, the Court split 4-4, leaving the Ninth Circuit decision in place. The case has significant political implications because organized labor, including public employee unions, is a key constituency of the Democrats and opponent of Republicans. Whether they’re called “union dues” or “agency fees,” the forced payments at issue in Friedrichs are funds on which the unions and Democrats depend. We expect to see public school teachers in other circuits, which are not bound by the Ninth Circuit decision, file lawsuits challenging similar provisions in their own collective bargaining agreements. NLRB upholds micro-bargaining unit at Volkswagen Chattanooga - A panel of the National Labor Relations Board, in a 2-1 decision, has found that the maintenance worker “micro” unit at Volkswagen’s plant in Chattanooga, Tennessee, was an appropriate unit for the election that the United Auto Workers won this past December. The Board panel majority – consisting of Members Kent Hirozawa and Lauren McFerran – applied the Board’s Specialty Healthcare standard, which essentially permits a union to organize any classification or grouping of employees with a community of interest unless other employees share an overwhelming community of interest with the group the union seeks to organize, thus making the petitioned-for unit inappropriate. Members Hirozawa and McFerran decided that the maintenance workers alone were an appropriate unit for bargaining despite the fact that they worked side by side with production workers in the plant, and were divided among the production departments and not subject to separate supervision as a unified maintenance group. As we previously reported, on the heels of the UAW’s December 2015 election victory, the UAW filed a slew of unfair labor practice charges, including the allegation that Volkswagen was unlawfully refusing to bargain. Volkswagen was engaged in a “technical refusal to bargain,” seeking an NLRB ruling on the unit question, asserting that the maintenance-worker-only bargaining unit was inappropriate because those employees shared an overwhelming community of interest with the other employees in the wall-to-wall unit at the plant. The UAW attempted to organize all of the production employees at the Chattanooga plant but lost a facility-wide election in February 2014. Volkswagen now has its ruling on the unit question in a one-sentence Order of the Board panel majority, with a two-page footnote and a one and one-half page dissent from Board Member Philip Miscimarra, who contended that the Board’s use of the Specialty Healthcare standard was in derogation of its role under the National Labor Relations Act. Bargaining for the Chattanooga maintenance worker unit is now one step closer. Volkswagen plans to appeal over the matter, but the UAW may have found its way to get a “beachhead” to the production group. NLRB fails to bargain in good faith? - In connection with the recent relocation of the NLRB headquarters in Washington, D.C., the Board and the National Labor Relations Board Employees Union agreed to rules for bargaining over the relocation (“effects bargaining”) and set aside two days for bargaining sessions. After two days, the union representatives apparently weren’t done, but the Board terminated bargaining anyway. The union then filed a charge with the Federal Labor Relations Authority, alleging that the Board violated the Federal Service Labor-Management Relations Statute. At a hearing before an administrative law judge, the Board contended that the union had waived more than two days of bargaining when it entered into the “two-day” agreement and that the parties reached impasse at day two. The ALJ saw things differently, finding that the agreement could not reasonably be interpreted as a waiver of bargaining beyond two days and that the evidence conclusively demonstrated that the parties had not reached impasse. The ALJ noted that several factors established that “there was a strong potential for further and productive bargaining, if only the Agency had the patience to persist beyond its arbitrary deadline.” The ALJ concluded that the Board violated its duty to bargain and deprived the union of a proper opportunity to negotiate the impact and implementation of the move to a new headquarters. This is yuge. Union endorses Donald Trump for President - Admittedly, it’s the National Border Patrol Council, but still. Breaking the nearly solid wall of support of organized labor for the two Democrat candidates for President, the National Border Patrol Council on March 30 issued a statement of support of the candidacy of Donald Trump for President. In campaign statements, Mr. Trump has indicated that he would base his immigration and border control policy largely on advice from the Border Patrol agents on the “front lines” of the immigration issue, instead of political appointees and government bureaucrats. Uber announces $100 million settlement of independent contractor class actions in California and Massachusetts, but is it “whack-a-mole” time? - On April 21, Uber and plaintiffs’ counsel announced settlements of class litigation in California and Massachusetts, in which Uber drivers contended that they were employees and not independent contractors. Uber takes the position that it simply provides a “virtual-matching service” for drivers and riders, and is not the employer of the drivers. The deal between Uber and the 385,000 drivers in the classes involves a structured settlement, under which Uber could pay out as much as $100 million. The drivers, with possible funding from Uber, may form statewide associations to deal with Uber regarding driver issues. Uber also has announced that it is making some changes in the terms and conditions of the contractor relationship that are expected to address some of the attributes of “employee” status about which the drivers complained in the lawsuits. Among other changes, Uber will allow drivers to post signs about tips, and will be more lenient with its rules providing that drivers will be deactivated for refusing to provide rides. What does the $100 million buy for Uber? In the short term, it’s getting peace with respect to the two class actions in jurisdictions that are not always friendly to employers’ interests. Moreover, the drivers have apparently agreed that Uber may continue to classify them as independent contractors. But Uber is not out of the woods, given that federal, state, and local regulators, as well as drivers in other states, are not part of the settlement. 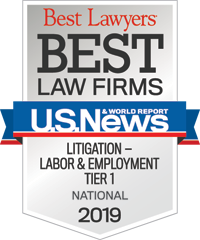 For example, NLRB General Counsel Richard Griffin recently issued a memorandum indicating that he wants all NLRB cases involving independent contractor misclassification to get priority treatment and review by the NLRB’s Division of Advice. Likewise, the U.S. Department of Labor Wage and Hour Administration has issued tough guidance on independent contractors versus employees. Meanwhile, the California Development Department has determined that an Uber driver is entitled to unemployment benefits. (Uber apparently has sought review of the California decision.) In Seattle, the city government enacted an ordinance that allows independent-contractor-for-hire drivers to form unions. In response, the U.S. Chamber of Commerce sued the city, asserting federal preemption of local and state laws by federal labor and antitrust law. And on April 22, one day after news of the California and Massachusetts settlements was released, drivers in Florida brought a putative collective action under the Fair Labor Standards Act. The Florida drivers, whose suit is pending in federal court in Miami, seek nationwide relief and classification of the drivers as employees. Could it get any more complicated for Uber? Yes. Also on April 22, the Teamsters union announced plans to form an association of ride-share service drivers in California. If the association or any other gets support from Uber (under the terms of the settlement or otherwise), and if the drivers are ultimately determined by the NLRB to be employees rather than independent contractors, then there could be issues regarding support of a labor organization by an employer. This is unlawful under Section 8(a)(2) of the NLRA. So it seems that Uber – as well as entities with similar business models – may be whacking one mole, only to have seven other moles pop their heads up elsewhere.